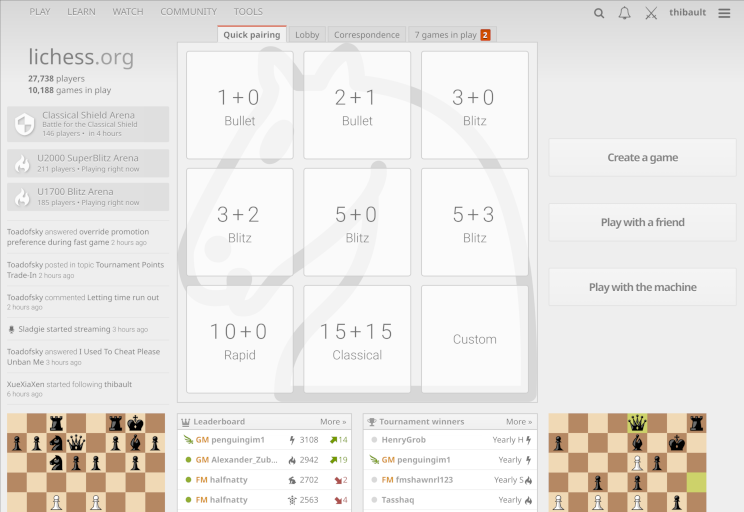 9 years ago, when I started Lichess, I was not a web designer. I had no clue how to use colours, and so Lichess is grey. 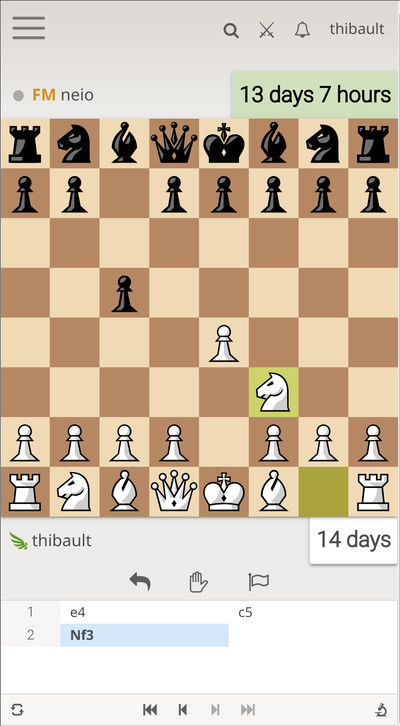 I couldn't draw images, so Lichess is just text and plain boxes. I didn't know how to make a pretty website, so Lichess is minimalistic and functional. 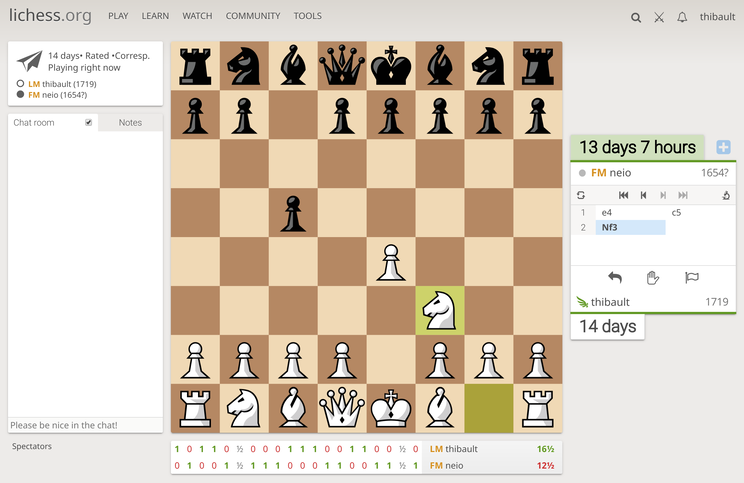 Early version of Lichess, in February 2011. It worked pretty well, and the same design - or should I say, absence of design - has survived all these years, and brought us to where we are. Therefore, we're not going to change it. The website cannot be used with smartphones and tablets. It doesn't make use of large desktop screens and TVs. The code is getting old and needs a rewrite with modern tools. It's time to address these issues with a complete rewrite of the website user interface. Play page v2 on a vertical phone screen! The website will scale to fit your screen, and you will be able to use it on your phone. Every page is redesigned slightly: The site title moved to the top bar, colours adjusted, and all elements tweaked to make better use of the screen space. Font size increased to default browser value. Zooming in should no longer be necessary for most of us. Thanks to the upgraded code base, the user interface is even leaner and faster than it used to be. The full-page menu is gone. All its functions are accessible from the drop-down menu on the top of the page. Streamers need to adjust their layout to account for the board being at a different position. Most userstyles and browser extensions for lichess will need to be updated. 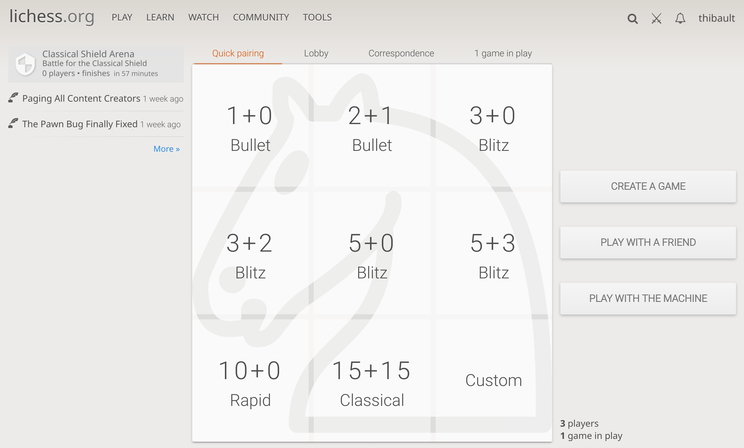 We all love Lichess' sleek and minimalist design. It's here to stay. 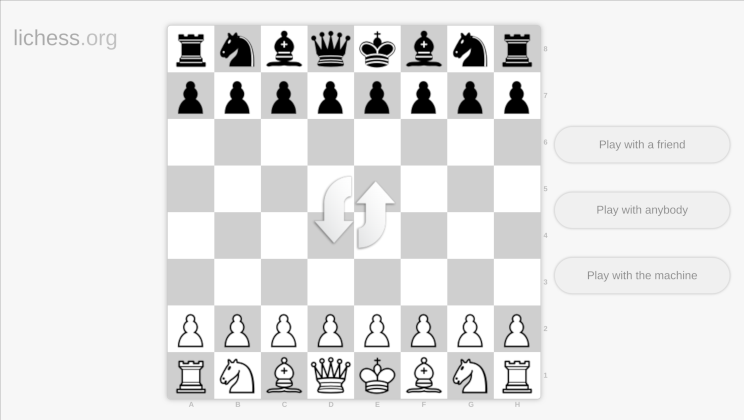 Same streamlined and plain look, with a focus on the chess board as the central and most important object. Most pages keep the same overall layout as before, so you don't need to relearn how to use Lichess. Obviously there are still no advertisements, no tracking, and no nonsense - and there will never be! All the code remains open source, under the same AGPL-v3 license. 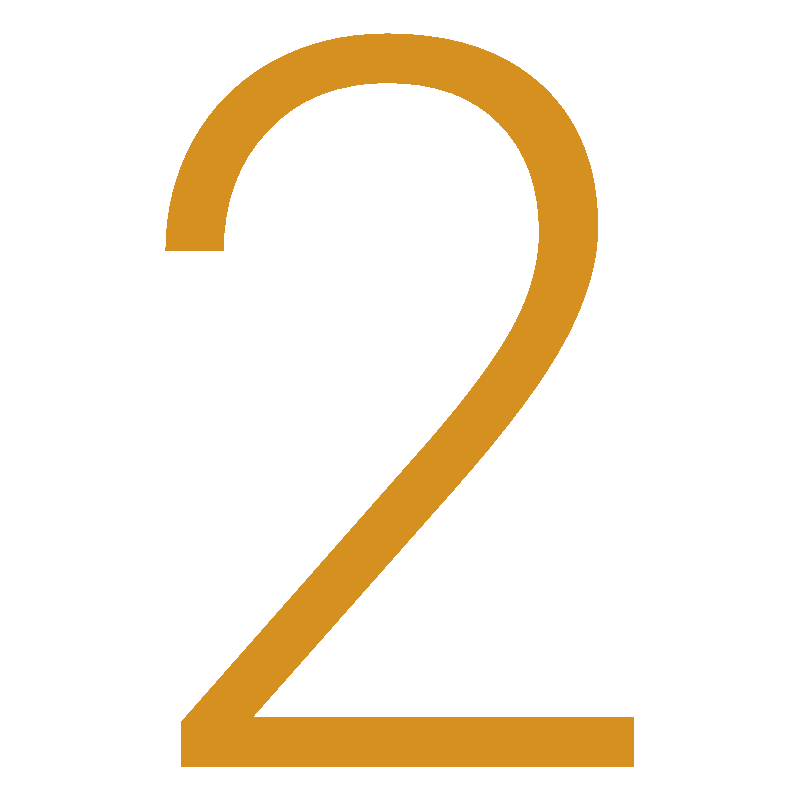 Here are the changes from v1 to v2. All the existing board themes and pieces sets are still available. We decided to use the very best tools available for the new website. By relying on cutting-edge technology, we can offer our players the absolute best speed and quality that the Internet has to offer. Supporting older browsers requires compromises that makes the experience worse for everyone. For that reason, we are dropping support for all versions of Internet Explorer, and for old versions of Edge, Safari and Opera. Any exotic browser with a modern rendering engine. If your browser is not in that list, then you will not be able to use Lichess. You must install a modern browser. If you can, install Firefox or Chrome on your computer. It's very easy, and you will get a much better browsing experience overall. As a bonus, for a safer and faster browsing, we recommend installing a trusted adblocker. If you use a corporate/school computer, and you can't install new software, ask your system administrator to do it. You shouldn't be stuck on an old and unsafe web browser. We know that a few players will not be able to get a modern browser. We are very sorry, but we cannot indefinitely support deprecated browsers. We need to move on in order to make Lichess better. When will the v2 land? When it's ready! We are still rounding the edges and testing it, to make the transition as smooth as possible. We don't have a release date, but you can safely expect it within a month or two. It will not be possible to revert to the old version. Once we release v2, there will be no going back, for anyone. I know that unwanted change can be unpleasant, and it will take some time to get used to. But trust me on this: it's for the best. The new version is superior in every regard, and I'm sure you're going to love it. Thank you for reading, and may your pieces always find their mate.